The Great Pennsylvania Music & Arts Celebration – Historic Allentown Fairgrounds Memorial Day weekend festival. FREE and family friendly. Historic Allentown Fairgrounds Memorial Day weekend festival. FREE and family friendly. 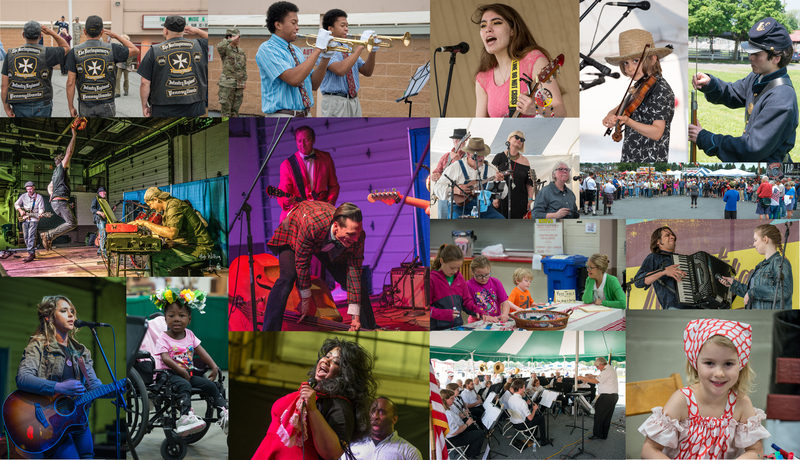 THE GREAT PENNSYLVANIA MUSIC & ARTS CELEBRATION 2019! FREE admission and Family Friendly Fun for all ages at the historic Allentown Fairgrounds on Memorial Day Weekend 2019! Saturday May 25, noon to 10:00 pm, Sunday May 26, noon to 10:00 pm, and Monday May 27, noon to 8:00 pm. So we don’t forget to remember. Honoring those who have fallen, honoring our veterans who are with us while celebrating Pennsylvania’s music and arts from their Pennsylvania Dutch beginnings to today. Live music ranging from Polka to Rock to Folk to Latino and more! Hex signs and local arts and crafts! Great food showcasing Pennsylvania’s historic and emerging Culinary Arts traditions from a large variety of vendors! Highlighting Pennsyvlania’s Brewing and Vinter Arts! Outstanding beers and wines highlighting Pennsylvania’s historic beer making traditions (including the oldest brewery in nation) and Pennsylvania’s wine industry (ranked #10 in vineyards and #4 in wine volume), with the top American Wine Society chapter in the nation right here in Lehigh County! All at the historic Allentown Fairgrounds, celebrating the heritage of Camp Crane. Most of these great activities will be housed in the Agri-Plex, so you won’t have to worry about the weather! The Fairgrounds are handicapped-accessible with plenty of free parking a few steps away from the festival. The Society looks forward to ushering in the summer of 2019 with its Celebration and to reminding you about The Great Allentown Fair which closes the 2019 Lehigh Valley festival season and Cedar Crest College’s Mayfair which will also take place on Memorial Day weekend, making Allentown your go-to place for Memorial Day each year! Please join us!